With the proliferation of vampire/werewolf/whatever novels over the past decade-plus, you need some serious confidence to throw your hat in that ring. A writer needs to differentiate themselves from everything else out there, whether through world-building or a clever hook, and they need to do it without looking like they’re trying too hard. 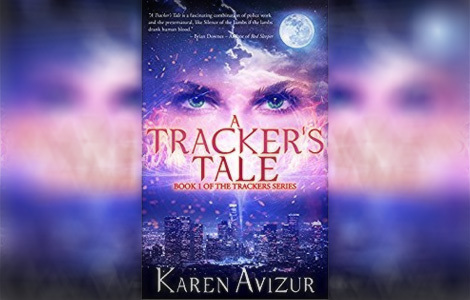 In A Tracker’s Tale, author Karen Avizur does it the old-fashioned way, with a unique and interesting character. A Tracker’s Tale lets you know right out of the gate that supernatural creatures exist and openly (kind of) live amongst us regular humans. Aside from calling them parasapiens, the author spends little time telling the reader what these creatures are all about; she assumes you know (and by this point in your life, shouldn’t you?). No, this story is all about our new heroine, Katherine Colebrook: what is her life like in this alternate reality? What makes her tick? Katherine recently moved to Los Angeles with her teenage daughter, Alexandra, where they try to adjust to life in a new city. Katherine works for the FBI as a Tracker. She has strong psychic abilities, which attunes her to the parasapien world. Oh, and she knows a few spells, too. Alexandra has inherited her mother’s abilities, which sets her apart at school, so she spends much of her time alone at the library. That’s about all you need to know. There’s no larger plot here, it’s more of an “a day in the life” kind of tale – though it spans more than a day. In A Tracker’s Tale, Katherine will have several cases that take her to different domains in the parasapien world. Some of these stand alone, but several link together to build a base that ultimately sets up possible storylines for future installments. Yet the author aptly weaves each storyline together as if it is one longer tale. It works well. I found I wasn’t concerned about an overarching plot, which is really unlike me. Katherine is a well-drawn character; it’s easy to get swept up in her goings-on. However, I think the author only touched the surface. That’s okay, because it should leave plenty of dramatic possibilities down the road. She’s the kind of character you could build a series around. The psychic ability Katherine displays, and how she uses it, is smartly done. The way the author presents the visions and psychic interactions draws you in. These are easily the best parts of the story because they are loaded with raw emotions, purpose, and revelations. You learn as much about a secondary character through the psychic insight as you do through standard physical descriptions and obligatory dialogue, which makes them seem even more unique. There are few curiosities. Katherine appears to have an unchecked license to kill from the FBI and she’s quick to use it. She’s also never really tested to her limits. One stretch near the end almost goes there, but she’s able to knife through it pretty cleanly. Alexandra is a strong-willed teenager, but she’s missing a some of the peripherals that go with been an out-of-place teen. Some of her actions almost stretch believability too far. It’s an introductory tale, though, and these points didn’t change my enjoyment of the story. If the author builds on what they delivered here, the series will be worth reading.